Hello! Can you believe it's the end of January already! Time to start preparing for Valentine's day! Earlier this week, one of my coworkers asked me to make a vday card for her to give to her daughter (6 yrs old). She likes dogs, so a card with a puppy would be great. Here is what I came up with. Also, I made my 2000th post on the cricut messageboard. I joined the board on May 10, 2008... that's a lot of chatting in 8.5 months! LoL! Here is my take on the challenge over at The Cuttlebug Spot (http://thecuttlebugspot.blogspot.com/). 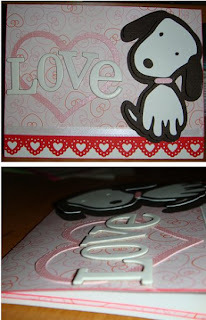 Challenge #14 is a Valentine's day color challenge... make something for valentine's day but without any pink or red! Such a fun challenge. For this I used the Heartblock embossing folder. Also, I bought the Singer Pixie sewing machine and this was my first sewing project! 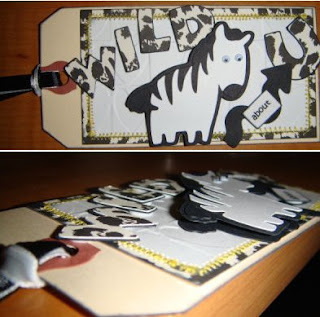 WILD - Mickey Font cut @ 3/4"
U - Mickey Font cut @ 1"
Zebra - Zooballoo cut @ 3" and pop dotted once. arrow - Accent Essentials cut @ 3/4"
This is the birthday card I made for my dad. 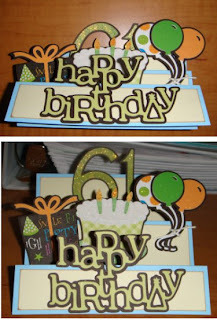 happy birthday - Doodletype @ 2"
cake,balloons,present - SYI @ 2.5"
61 - Alphalicious @ 2.5"